On pace for their worst season since the 1996-1997 season (excluding the half season played after the 2012-2013 lockout), the Sens need a face lift. Twelve games into the season with a 5-2-5 record, they had 15 out of a possible 24 points which was above .500, the team looked a little shaky but they showed a lot of promise. Derick Brassard and Mark Stone looked like one of the best duo in the NHL. Stone was looking like the All Star he is and Kyle Turris was still in a Sens jersey. With 5 OT loses it was just a matter of tweaking a couple of things but this team looked like it could be a contender once again. Today the Ottawa Senators sit in 29th in the NHL with a 21-28-9 record. The Sens have traded Dion Phaneuf and Nate Thompson to the LA Kings for Marian Gaborik and Nick Shore. Chris DiDomenico is no longer an Ottawa Senator. After bouncing around all season he was traded to the Chicago Blackhawks for Ville Pokka. Sens have a new CEO, Mr Eugene Melnyk himself. Craig Anderson and Mike Condon continue to struggle as the worst goaltending duo in the NHL. Some games you could see a lot of fight come from this team but most games, they look like they’re ready for the off -season. Don’t expect too much more to happen in the following week as most moves will be made during the off-season. That being said, Pierre Dorion has proven that he’s not afraid to make big moves during the season. Who will potentially be moved before trade deadline? Here are some potential trades coming in the next week or possibly during the offseason. The Blue Jackets could really use some help in the faceoff circle and why not look for a familiar face. The Ottawa Senators are looking to get younger and faster they would get exactly that in Wennberg. Mayfield is a young, big defenseman who’s not afraid to finish his checks and play fisticuffs. After trading away Dion Phaneuf, Ottawa needs some good young blood on the blue line. The Islanders would be getting back JG Pageau who’s a penalty killer, has a knack for short handed chances and shows up in the playoffs, two things the Islanders will need if they make the playoffs and both have term left on their contracts and at a fair price. It’s no secret that the Ottawa Senators are sweating bullets: can the Senators afford to re-sign him? 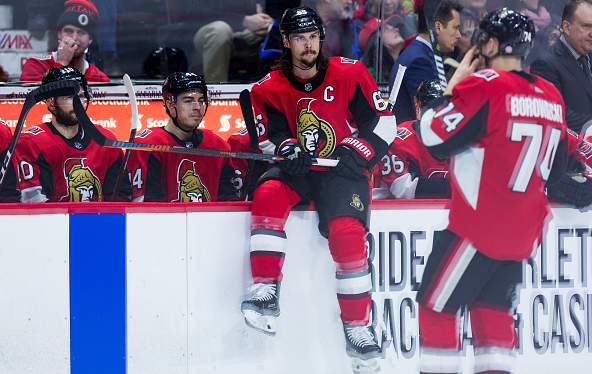 With another season left on his contract, this would be the ideal time to get a major return for Erik Karlsson. Colorado is on the upswing and to have a major superstar defenseman like Karlsson on their team would be a big step forward. Colorado also has the cap space to give him his big contract. In return the Sens would get a good young player with a bright future and some 1st Rd picks. Zadorov still has a season left on his contract and would be looking for a long term deal after next season. Some players are what we deem “untouchable. If asked for an honest opinion, here’s who should be deemed “untouchable”. Thomas Chabot, Mark Stone, Matt Duchene and Mike Hoffman. That’s it, everyone else should be shopped around. Chabot is already playing an important role on the blueline, he’s the future defenseman of this team and a future superstar. Mark Stone keeps setting the bar higher for himself. Every season he’s getting better than the last. Matt Duchene is a cornerstone, 1st line centerman who should be wearing an “A” on his jersey. Mike Hoffman, has had a lot of ups and downs this season, has been a 20+ goals every season since his first full season in the NHL. His shot and release is second to none. It’s clear as day that Craig Anderson is on a decline and Mike Condon will never be a number 1 goalie. Something to look at would David Rittich. The 25 year old is in a contract year has 14 games this season (2.68 GAA and Save% of .915) but will not be an expensive contract. If Ottawa could trade Condon and a 3rd round for him, resign him to a bridge contract, this might be quite the steal. I would love to see what he could do with more games under his belt. It would be nice to see Rittich and Hogberg compete for the number one position in a couple of seasons. Come puck drop in October for the 2018-2019 NHL season, this team will look very different. Pierre Dorion will be busy rebuilding this team and it will be a much younger and faster group. Dorion has moved one bad contract this year by trading Phaneuf, but I don’t think Bobby Ryan will be going anywhere. If he stays healthy, there can still be a chance for him. Don’t expect this rebuild to take too long to be competitive because there will be a lot of NHL experience coming back in trades. As far as coaching goes, Guy Boucher should be given another chance to do things a little differently next season. Previous Post: Should New York Rangers Trade Henrik Lundqvist?